If your organization has a job improvement worth showing off, it’s not too late to enter this year’s challenge. But, hurry up…the contest ends today, September 11th, at 5 p.m. Eastern. Check out our website for details on how to enter. The winner of the first Find It – Fix It Challenge (2007) was Gerdau Ameristeel’s Charlotte, NC plant for its Bricklayer – Taphole Sleeve Lifting operation. 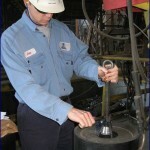 Before the fix, an operator had to manually lift and install an 80-pound taphole sleeve. Awkward postures were maintained to complete this task. 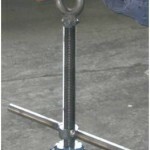 The company fabricated a spreader clamp, which allows the operator to use a crane to lift and install the sleeve. This improvement eliminated all high risk postures. To see more amazing job improvements, register to attend the live webinar, “The Winner of the 2015 Find It – Fix It Challenge Is…” on Friday, October 9th. We’ll also recognize the final 15 entries of both the “simple” and “complex” categories. To register, visit the events page of our website!